Composition of 75 paintings, 14 ½ x 23 ½ inches each. Oil on canvas. The farm is a vernacular element of the Midwest and very explored as a motif in painting, as by Grant Wood, Iowa’s most famous painter. Even at the risk of falling into the cliché, I finally decided to paint this theme without prejudice. The rule of 25 is that this number appears in this work in several ways. There are three groups of 25 paintings. Each represents a time of the day: morning, noon and evening. 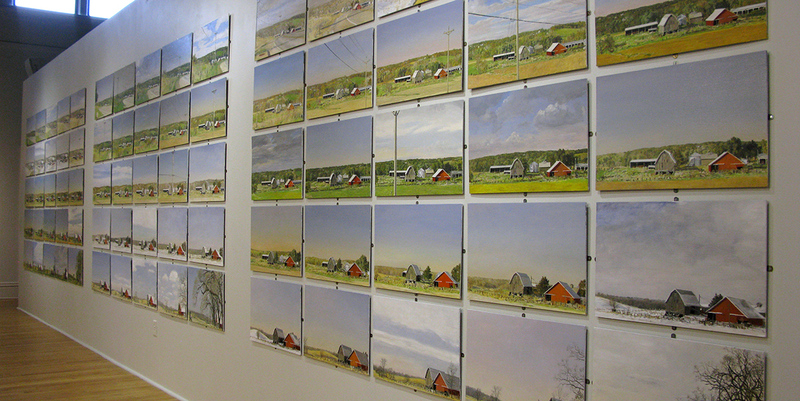 The 75 views of the farm are painted all along a hillside at Prairie du Chien Road in Iowa City. Once a painting was completed, I walked forward and backward counting 25 steps and painted a new vision from those new distances. In the group of the morning I moved closer and closer to the farm in each new picture. In the afternoon in the opposite direction, uphill. Always moving forward or backward 25 steps between one frame and the other. And at noon I started at a point in the middle, alternately moving up and down. At one point the paths and visions crossed, but they never coincided at the same point. And as I spent several days or weeks in each, the crossing occurred in different times of the year. In addition to the 25 steps and 25 frames in each series, the rule of 25 also applies to the weather conditions when I painted them. For example, when temperatures dropped below 25 ° F, it was no longer convenient to paint continuously for more than 25 minutes. When the wind blew at more than 25 miles per hour, it was almost impossible to control the brushstrokes. The canvas moved too much. And it was even dangerous. I painted with an umbrella to prevent the sun from giving me directly on the canvas. I tied it tightly to the chair, but one day, with a gusty wind, it broke loose and like an arrow went to nail right into the rear window of my car, pulverizing its windshield.